The performance of organic light-emitting diodes (OLEDs) is determined by a complex interplay of the optoelectronic processes in the active layer stack. In order to enable simulation-assisted layer stack development, a three-dimensional kinetic Monte Carlo OLED simulation method which includes the charge transport and all excitonic processes is developed. In this paper, the results are presented of simulations including degradation processes in idealized but realizable phosphorescent OLEDs. 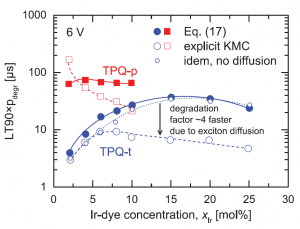 Degradation is treated as a result of the conversion of emitter molecules to non-emissive sites upon a triplet-polaron quenching (TPQ) process. Under the assumptions made, TPQ provides the dominant contribution to the roll-off. There is therefore a strong relationship between the roll-off and the lifetime. This is quantified using a “uniform density model”, within which the charge carrier and exciton densities are assumed to be uniform across the emissive layer. The simulations give rise to design rules regarding the energy levels, and are used to study the sensitivity of the roll-off and lifetime to various other materials parameters, including the mobility, the phosphorescent dye concentration, the triplet exciton emissive lifetime and binding energy, and the type of TPQ process.